At JustMensRings.com, we are always on the lookout for groundbreaking fashion trends in men’s jewelry and accessories. One of the most fascinating trends on the rise is geometric prints and patterns. You don’t have to be a verifiable genius to figure out how flattering stripes and checks can be. Our men’s designer cobalt chrome wedding ring with carbon fiber is the epitome of class and distinction. Modern grooms are demanding more than traditional metals or classic designs. Take any look to the next level with the help of our 8mm men’s designer cobalt chrome with carbon fiber wedding ring. This men’s designer cobalt chrome wedding ring with carbon fiber features a black geometric inlay surrounded by a gleaming cobalt chrome band that commands instant attention and respect. Cobalt chrome boasts an everlasting strength that is five times harder than gold. Better yet, the tantalizingly silver hue can compete with silver or platinum any day of the week. Best of all, our 8mm men’s designer cobalt chrome with carbon fiber wedding ring is designed with a masculine edge in mind. The contemporary groom deserves more panache, more exclusivity. 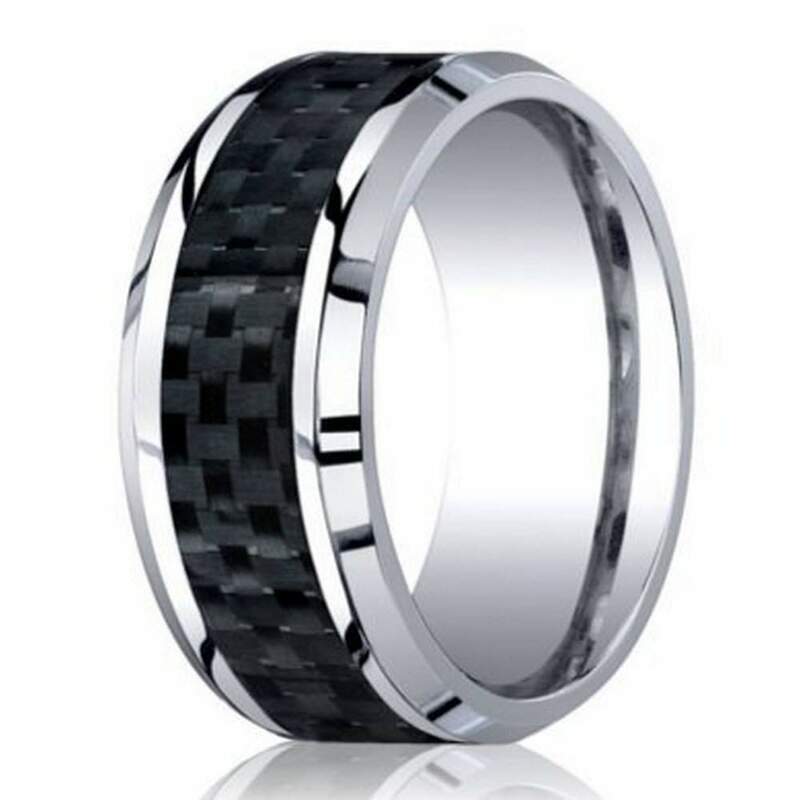 Give him exactly what he’s looking for by choosing our black geometric wedding ring today. Each men’s designer cobalt chrome wedding ring with carbon fiber features a comfort-fit band for the groom who leads a busy or active lifestyle. We recommend that you have your ring finger measured for a comfort fit ring at your local jewelry store to double-check the best size for all-day comfort. Please contact us today with any questions or concerns, and a member of our jewelry team will gladly help. The ring is of very nice quality, and the engraving came out well. My only complaint is they tell you to buy a 1/2 size larger for comfort fit and get sized, however, even after doing that, the 8 1/2 (he's normally an 8) was a bit large. My lovely fiance' wanted to get me a ring in conjunction with the ring that I presented her. After a few months of looking she settled upon this band. I am incredibly satisfied with the quality of the ring, as well as the design. Thanks for your stellar service to her. This ring will remind me of why I love her so much.